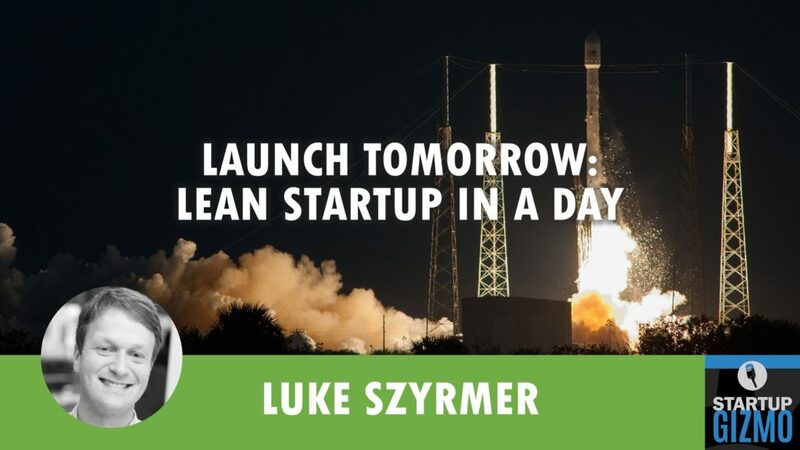 In this episode, I am sitting down with Luke Szyrmer, an experienced product manager from London, to discuss his new book, Launch Tomorrow. Alex Makarski: Hello and welcome. This is Alex Makarski with another episode of StartupGizmo. And today, I have with me Luke Szyrmer hanging out with me from London on the opposite end of the pond, but he’s sporting a nice shirt that says University of Pennsylvania, I take it. So I guess there’s a story coming up. Luke is a sought after authority in all things lean and startup and is the one who runs Lean Coffee events in London. And he is an author of Launch Tomorrow, the book on launching a startup, a tech startup, I presume, that hit number one on Amazon in its category recently. So, congratulations on the book, Luke, and welcome to the show. Luke Szyrmer: Thanks, Alex. Yeah, it’s great to catch up with you. Alex Makarski: Awesome. So what’s up with this Pennsylvania theme going on here? Luke Szyrmer: Well, I grew up in the area. But I went there a while ago and graduated. And it was a good time and it taught me quite a lot, did economics there a long time ago. But somehow I got into IT and it stuck on me for 20 years or more at this point in various forms. Alex Makarski: Right. So what led you to writing a book? Luke Szyrmer: So the main reason is that I, at some point, tried to create a product that I thought would be relevant for hedge funds here in London. It was about the time YouTube was becoming a thing and it was a video website, and aimed specifically at that vertical, which at the time I thought was a great idea and I put a lot of heart and soul and savings into it. And after basically launching it, it turned out that they weren’t really all that interested and it didn’t resonate with them pretty much at all. And I realized that even though I, from a technical standpoint, had something that was working, that clearly wasn’t enough that I very much had a marketing problem. And at some point, about two or three years later, I discovered the work of Eric Ries – The Lean Startup – and one of the things that he advocates there is going out and speaking with customers, interacting with them long before you even started building some sort of product just to be able to really understand who it is that you’re creating something for. And over time, the part that I found the most interesting was something that he briefly described in The Lean Startup over a couple of pages, it’s using a landing page to test out a product idea. So, it’s kind of like a smoke test. Originally, the term “smoke test” comes from electrical engineering. So basically, if you plug it in, does smoke come out of it? So, here, it’s a slightly different connotation. So, basically, it’s just a quick test to make sure that if you are going to go in a certain direction, from a marketing point of view, there is actually somebody who’s there, who’s waiting for that product to be made. Alex Makarski: If it’s even worth putting any more effort into it. Luke Szyrmer: Exactly. Exactly, that’s the whole point. And it’s a slightly different way of approaching the whole topic than, on one hand, customer development, which I just mentioned because there you’re trying to get lots of information and speak with lots of people. And it’s also a different kind of conversion rate optimization where you already have something that you’re selling and you just want to be able to sell better. And that mentality, that framework, other than that sliver within The Lean Startup and occasionally mentioned here and there, nobody is really covering it, and I realize that it’s something worth testing on its own. So what I did was I went to cycle Leanpub which essentially led me start writing a book, basically describe a book, without necessarily having it done yet and to see if people would start buying. And lo and behold, people did start paying me even though it wasn’t done. They were happy to wait for me to finish it, which basically proved that there clearly was unmet demand for this particular topic. And I went ahead and created it and launched it and that went well. Alex Makarski: Nice. I didn’t know you used Leanpub. I love the concept. I think they certainly have their own place in the publishing universe. Figured out very well, they have their own unique selling proposition figured out very well. Alex Makarski: Beautiful, beautiful concept. Luke Szyrmer: Yeah, especially since pretty much everyone I talk to in terms of publishings, it seems like one of these really irreformable industries. So Leanpub is one of the number of startups that are trying to do something that’s allowing authors, certainly, to interact with their audiences. And for me, it was more of like a product’s creator hat. And I’d be talking with lots of entrepreneurs, tech entrepreneurs mostly, through people I’d meet through the meetup. And just seeing what they actually needed if they were doing these kinds of tests or if they were doing lean startup and I’ve tried to condense all of that into a nice, usable, actionable form. Alex Makarski: And condense you did. I must say it’s previously agreed. I went through a good chapter of the book. It’s a lot of stuff packed into just one book. You can probably expand it into like a trilogy or, I don’t know, a series of five books or something, easily. Luke Szyrmer: Yeah. Do like a Game of Thrones theme or something. Alex Makarski: Let’s do it. Let’s do it. There’s no one here to stop you. So, who should avail themselves of your book? Who is it for? Alex Makarski: And just so that someone uninitiated can understand, what does MVP stand for? Luke Szyrmer: Sure. So MVP stands for Minimum Viable Product. So this is a term that Eric Ries popularized. It’s not actually something I came up with. And the idea is that it’s some kind of a product or something similar to a product that you create only for the purpose of testing one specific thing at a given moment. So with a landing page MVP, what essentially you’re trying to do is creating a landing page to make it look like you have a product or that you’re preparing a product and either simulate a check-out type of scenario where somebody tries to buy the product and essentially you either return them their money but knowing that there are people who are willing to pay for the product. Or, for example, you pre-sell, where you clearly stay on the landing page that the product is still being prepared. But if you buy now, you can buy it for less, for example. Alex Makarski: Most recent example being Elon Musk pre-selling a bunch of cars to a whole bunch of people. Alex Makarski: That’s a very good example of MVP. Luke Szyrmer: Yeah. In that sense, yeah. So the critical thing, a lot of people debate whether is the minimum the most important part? Is it the fact that it’s a product? Or is the viable bit important? And actually, if anything, of those three, probably the viable bit is the most important, where you’re trying to figure out if something is viable. But beyond, stepping back behind that, it always needs to be framed as an experiment. So what are you trying to learn? And you state it as a hypothesis with a specific success criterion. Then you go and you execute, and then you step back and say, “Is the hypothesis true or not?” Using that kind of an approach, you can find out a lot that you don’t know and essentially de-risk quite complicated, complex ideas which would otherwise be very easy to run you into the ground, basically. So you’re basically chipping away all of the bad stuff and just focusing on how particular product idea could work. And if you look at most of the big companies, tech companies today, if you look at their early days, almost every single one of them had a major pivot early in its history. So, for example, Twitter started out as a podcasting service and when they were running out of money they created this thing that did short blogging with 140 characters and that just took off. Alex Makarski: Airbnb thought people would want to put air mattresses in spare rooms and that’s how they started and that’s why it’s called Airbnb, right? Luke Szyrmer: Yeah, exactly. So, in fact, the story behind that is that they were putting mattresses in rooms because that was the way that they were making money until they find their big idea. And then they realized that actually is the big idea, that renting out spare rooms is actually a massive market and it’s a complete structure of the hotel industry. So they were making money with all kinds of things, like selling cereal boxes with political messages and all kinds of stuff just to be able to make ends meet. And it turned out that that’s actually what took off. So, regardless of whether or not all of these startups were doing a strict lean startup process, I think some of them were doing more so than others. Certainly Dropbox is quite a famous case study for lean startup. There’s quite a few other reasonably big ones nowadays coming from that whole account. It’s just a way of being very structured about learning what it is you don’t know. The actual niche that my book Launch Tomorrow fills is how you do that online. So it’s with web pages, with advertising, as you have people going online interacting with your product, whether it’s just that landing page or it’s more. There’s a whole bunch of different kinds of testing that you can do and essentially market research as you’re expanding the product. Alex Makarski: So the product doesn’t have to be a technical product or an online product necessarily. It’s just that you target people who launch a product online. Luke Szyrmer: Yes. So I think at some point most products will have some kind of an online presence and in fact, it’s enough just to have one landing page to do this kind of testing. And you can do things such as, first of all, like I was saying before, testing if there is demand, testing how your path to market looks. So, for example, whether or not paid advertising is a good source of traffic for you. So whether Facebook and AdWords would be good for you, how much that would cost. As you are buying those things that’s really valuable to test at that point is a valued proposition and a hook into your audience. So, even if you don’t end up using paid advertising as your ultimate traffic source, at least, you’ve got a tested message that’s clear, that speaks to your intended audience, and that you also have tested that it ultimately leads to sale. So you can still continue, you can essentially build out your funnel as you’re initially buying traffic. Then afterwards you can switch to a completely different kind of traffic but, at least, you know how the funnel works and make sense of what percent of people actually come to your page, end up checking out, and then you can do all kinds of things based on that. Luke Szyrmer: Yeah. So that’s the big idea. And I think specifically with the Launch Tomorrow, the idea was what I wanted to do to compress into one day a whole series of quick testing tools and planning tools to be able to set up a landing page and buy some advertising. And already do a whole series of tests before you even buy that advertising so that when the people do come and see your page at least you’re reasonably confident that you are presenting what you think you’re presenting, which is actually a more common problem than most people think, that it’s completely unclear to people coming up, even though you think it’s fair to you. Or also to make sure that your pages are loading, that you’re actually addressing the right people in the right way and that you’re really empathizing with your audience. So, it isn’t just talking about my gadget but actually trying to relate that to a particular type of person who you think it will be relevant for. And then it ends up influencing everything – your language, the way you describe it, and then of course you can still test variants of that once you are actually sending people to the page. Alex Makarski: So basically, with this approach, with the Launch Tomorrow approach, you never put more money at risk than absolutely necessary to figure out if it’s worth taking the next step, and also you buying some data to tell you which direction should take this stuff in. Luke Szyrmer: Yes, exactly. So you’re limiting your financial risk by controlling your ad spend and at the same time you’re essentially buying market intelligence. Alex Makarski: Awesome. How did you go about promoting your book? Luke Szyrmer: So, in terms of promotion it was largely based on my activity through the meetup, so part of that was just people that I met there of course initially. I think the launch itself, I guess at this point you could say the relatively standard things you would do at a book launch. So I had a contest for some books by Alex Osterwalder, who’s a well-known lean startup guy that he signed because he’d done an event earlier. Alex Makarski: Is that The Business Model Canvas guy? Luke Szyrmer: Yeah, The Business Model Canvas guy. And then also I met with other people coming through London that were doing events, so a lot of them helps tweak to their audiences about it, so that got the word out. And I just did a five-day free launch window. I got a lot of downloads then. And after that, there’s still a few of the big names that were promoting once it was in paid mode, let’s say, and it did continue doing well after that, and it’s been doing okay since. At this point, I think more of my sales come directly on my site than they do on Amazon. But it’s doing well. Alex Makarski: Congratulations! Speaking of which, what is the website where one should go to buy the book? Luke Szyrmer: Sure. So the website where you can go is www.launchtomorrow.com. Alex Makarski: Domain was available for you? Alex Makarski: You could find a dot com domain for that. Luke Szyrmer: Yeah. It was. It was very much so. Alex Makarski: People complain all the time they can’t find a good dot com domain and you just proved them wrong. Luke Szyrmer: Yeah, you can but it takes some time and in my case, also some testing which I described in the book. But in terms of what domain I actually ended up using, it was that combination. It was available and clearly, people liked it. Alex Makarski: Well, why don’t you take us through this example through this case study? How you came up with the domain name. Luke Szyrmer: Sure. I guess unlike Tim Ferriss who used AdWords, I mean at this point to use AdWords just to test something like a name is a bit excessive. But it depends on your cost and your budget. Alex Makarski: And again, sorry, I need to open up the shorthand previews in this conversation a little bit for someone who might not be familiar with the example. So we’re talking about The 4-Hour Workweek, it started out as a totally different book. Well, a totally different title originally. Alex Makarski: And Tim Ferriss went to do Google AdWords, run a few ads, and he came up with The 4-Hour Workweek as the winning one. And also that’s what he went to print with. Luke Szyrmer: Yes, exactly. The original title was Drug Dealing for Fun and Profit. Alex Makarski: There you go. Luke Szyrmer: Yeah, so 4-Hour Workweek I think just resonated on AdWords certainly more. And at the time when he was doing it in 2009, or ‘07, something like that, clicks generally across the board were a bit cheaper than they are now. Luke Szyrmer: So I actually ended up using a tool called PicFu. The way PicFu works is that it hooks into something called Amazon Mechanical Turk, which is a service Amazon provides, where people do small tasks in return for a small amount of money and it’s done at a large scale. And they provide an ability for programmers to hook into that and then instead of a computer do something, have a person do it. PicFu is one of a number of services like this. But what PicFu did is they created a system where they have people vote on two different options of something. So, for example, titles or images or domain names or anything like that. And the way that I did it was I initially came up with, I believe, eight different names and pitted them against each other and this was the one that came up to the top. To be honest, most of the ones that I did discard tended to be pretty, I guess, abstract. Alex Makarski: Do you remember some of the losers? Luke Szyrmer: I have to check. Alex Makarski: And did you go and check if all the dot coms available for all of those? Alex Makarski: I love the title. I honestly do. Launch Tomorrow is awesome, I think. Luke Szyrmer: Yeah. I think it hits the right notes and it also, to some extent, gave the book some structure because then it really focused me on that one-day launch sequence, that pre-launch sequence to get ready to get that page up and do a whole bunch of things that you can do in, say, 15 minutes each that end up, actually, if you accumulate them together, have a very big effect on the actual outcome. So the page that you do put up and when you do buy ads, since people are there that it’s much more likely to, at least, have any obvious things wrong with it to not go bad. Alex Makarski: Cool. How much did the whole experiment cost you, if you remember? Luke Szyrmer: That’s a great question. I’m not sure off the top of my head. In terms of just PicFu, I think at the time it was 10 bucks a test, and now they’re 20 bucks a test. Just the PicFu side of it would’ve been 70 bucks U.S., which for that amount of money AdWords it would’ve been a lot harder to get statistically significant data. Alex Makarski: Wonderful. That’s a great lesson, a great tip. Thank you very much. Alex Makarski: All right. Any other tips that stick out for you from your publishing process or anything that’s in the book that you’d want to open up a little bit? Luke Szyrmer: Sure, sure. I think one of the biggest surprises for me was that, in terms for landing pages and products and everything, was that if you look at audience selection, what it is that you offer and what’s on the landing page, of the three what makes the biggest difference in terms of response, in terms of sales is the actual audience selection. And it’s not like a 10% larger difference. It’s a seven times larger difference comparing the audience selection to the landing page. So basically, the importance of selecting your audience and making sure you really understand them is much, much larger than whatever you put on your landing page. In other words, whatever it is your product is, is actually much less important than really, really understanding your audience. And in terms of the proportions, in terms of how do I operationalize this, especially from the beginning those are the proportions where I’d suggest to people that that’s something that they should be spending their time and money. So basically, 62% of their time should be spent on analyzing the audience, 26% is figuring out what to offer them, and then the rest, the 12 percentage is actually designing the landing page. I certainly was thinking in these terms myself. But when you think of something like a landing page MVP, you started thinking of what’s on the landing page, how it looks, how it flows, this and that. But actually, it’s the off-landing page factors that make it succeed. And it’s being really clear on who your audience is and what segment you’re going after initially and that part of it is much, much more important than the actual product idea even. And on a purely intuitive level if you look at in terms of audience selection, there are certain groups like, for example, if you go into a knitting club of senior citizens, you’re going to have a hard time selling something like a Metallica t-shirt. Alex Makarski: I know Metallica, I think they’re old enough these days. Alex Makarski: I mean they’re old enough. Luke Szyrmer: How many of them are old enough? Exactly. Yeah, you might make a sale or two. I’m not saying you won’t sell any. But I’d be quite surprised if you’d actually get close to 100% conversion rate in that kind of environment. But if you were selling, I don’t know, knitting accessories or something, then that’s a very different discussion. So it’s essentially that kind of thing which if you’re starting up completely from scratch or entering into a new market with a new product idea, figuring out how to connect those two is critical. And the faster you do it, the cheaper you do it, the better off you’re going to be. Alex Makarski: Awesome. All right. Well, congratulations again on hitting number one on Amazon in your category. Awesome book. I recommend it to everyone. I have it on my Kindle. And the website where someone would go to and buy your book is launchtomorrow.com. And thank you very much, Luke Szyrmer, our lean startup expert. Thank you very much.